TGIF! For an affordable - and delicious - Friday night out, Sons of Essex in the LES recently launched a "Burgers, Brews and Oysters Happy Hour" to check out tonight. Weekdays from 5 pm through 8 pm this summer, diners can enjoy $1 Blue Point oysters, $5 drinks and the Essex Street Burger and Beer combo for just $12. Bay Ridge Blackout Cone - Chocolate Ice Cream, Chocolate Blackout Cake, Chocolate Cake Cookie, Chocolate Crumble and whipped cream. Strawberry Sunset Park Cone - Strawberry Ice Cream, Strawberry Blonde Cheesecake, Fresh Strawberries, Hazelnuts and whipped cream. 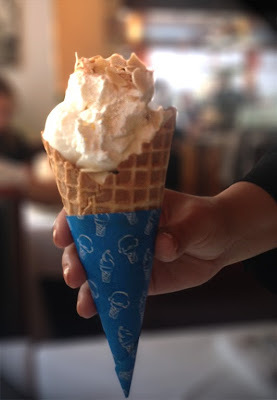 Canarsie Coconut Cone - Vanilla Ice Cream, Coconut Cake, Toasted Coconut, Toasted Almonds and whipped cream. Sunday, July 21st kicks off Belgian Restaurant Week here in NYC and is also Belgian Independence Day. To celebrate, luxury Belgian Chocolatier Neuhaus is offering special commemorative “Belgian Flag” box sets, mimicking the colors of the Belgian flag (black, yellow and red) available at the Neuhaus Madison Avenue flagship store. If you're dining out during Belgian Restaurant Week, Neuhaus is also offering complimentary chocolates at select participating Belgian Restaurant Week venues - so look out for them at MARKT, BXL Café & East, Brasserie Margritte, Braband and La Maison du Croque Monsieur. Satisfy your sweet tooth after sipping Belgian brews and indulging in classic mussels and frites!